The U.S.-Canada border is the longest international land border in the world. Originally created by the 1783 Treaty of Paris and revised nearly a dozen times since, the International Boundary, as it’s officially termed, comprises 5,525 total miles and touches eight provinces and 13 states. But scale alone doesn’t begin to describe this curious and sometimes confusing border. The U.S.-Canada border has a rich, storied history. More than 8,000 monuments and reference points and 1,000 survey control sites – maintained by the International Boundary Commission – dot the United States-Canada border. The boundary can be legally crossed via 119 land border crossing sites, six unstaffed road crossings, 13 international ferries and 39 rail crossings, as well as by air and sea. The history of the U.S.-Canada border is complex and long-reaching. Formally, it extends back to the very beginning of the United States as an independent nation. The first formal iteration of the International Boundary was established in 1783’s Definitive Treaty of Peace and Friendship between His Britannic Majesty and the United States of America, which ended the American Revolution. The line between the new nation and Great Britain’s North American colonies – which did not address territory west of the Great Lakes in detail – ran from “the North West Angle of Nova Scotia” to “the Northwesternmost Head of Connecticut River; Thence down along the Middle of that River to the forty fifth Degree of North Latitude.” The 45th Parallel was used as the dividing line west to the Iroquois River, and then roughly divided the Great Lakes. A minor revision followed shortly thereafter, with a declaration of Article V of the Treaty of 1794 affecting the boundary along the St. Croix River. On Dec. 24, 1814, the Treaty of Ghent formally ended the War of 1812. Among its provisions, the treaty restored the territorial status quo antebellum and called for the establishment of a demarcation commission to finalize issues related to the nascent boundary. The treaty is memorialized today by the Peace Arch, situated near the westernmost point of the U.S.-Canada border in the contiguous United States. The treaty of Oct. 20, 1818 – also known as the convention respecting fisheries, boundary and the restoration of slaves, and the Convention of 1818 – addressed U.S. fishing rights along the Newfoundland and Labrador coasts and provided for joint control of land in the Oregon Country for 10 years. Perhaps most critically, the treaty first set what would become a major piece of the U.S.-Canada border along the 49th Parallel. The Webster-Ashburton Treaty of Aug. 9, 1842, resolved the Aroostook War, a slight conflict sparked by significant disputes over the proper location of the international boundary between Maine and the British colony of New Brunswick. The 1842 treaty also provided additional clarification on the boundary in the Great Lakes region and reaffirmed the 49th Parallel as the international border up to the Rocky Mountains. The 49th Parallel was enshrined as the international boundary west of the Rockies by the Oregon Boundary Treaty of 1846. The agreement declared that “the line of boundary between the territories of the United States and those of her Brittanic Majesty shall be continued westward along the said forty-ninth parallel of north latitude to the middle of the channel, which separates the continent from Vancouver’s Island, and thence southerly through the middle of the said channel, and of Fuca’s straits to the Pacific Ocean.” The treaty, which also declared “free and open” navigation of the western waterways for both ships of both nations, was the first to extend the U.S.-Canada border from the Atlantic Ocean to the Pacific Ocean. Following the Canadian Confederation of 1867, the 1873 Protocol on the Canal de Haro established a firm boundary in the Haro Strait between San Juan Island (U.S.) and Vancouver Island (Canada). In 1903, an international tribunal settled a dispute between the U.S. and Canada over the boundary between Alaska (purchased from Russia in 1867) and British Columbia in the Alaskan Panhandle. In 1910, the Passamaquoddy Bay Treaty established an international boundary in Passamaquoddy Bay between Moose Island and Treat Island (U.S.) and Campobello Island (Canada). 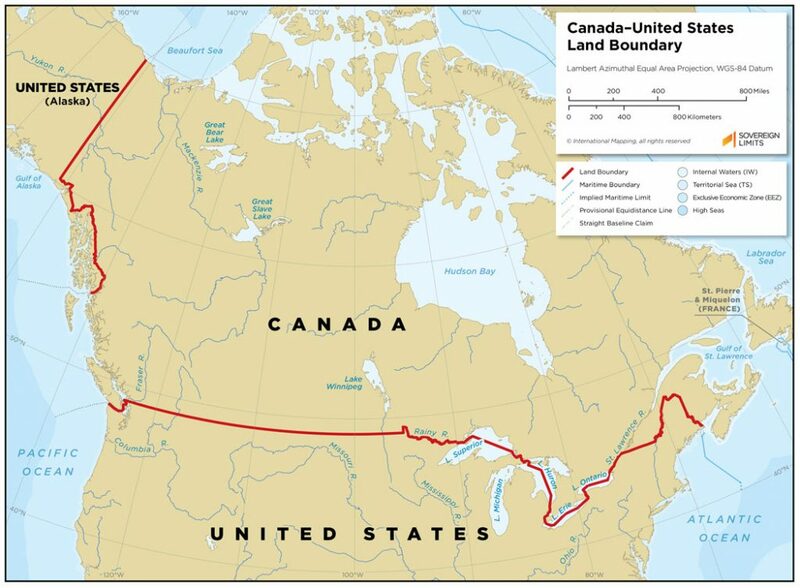 The 1925 “Treaty between Canada and the United States of America to Define More Accurately and to Complete the International Boundary between the Two Countries” finally codified large sections of the U.S.-Canada Border and formally established the International Boundary Commission. The United States, Great Britian and Canada have engaged in numerous boundary disputes – largely peaceful – since 1783. Four notable disputes continue today. Most notable among these – and ongoing today – is the controversy over Machias Seal Island. The sovereignty of the island, located about 10 miles off the coast of Maine in the Gulf of Maine’s “grey zone,” is disputed due to ambiguities in past treaties. The dispute is particularly heated given the area’s prolific lobster fishery, which has been open to Canadian lobstermen (by Canadian edict) since 2002. A Canadian lighthouse has continuously operated on the island since 1832. 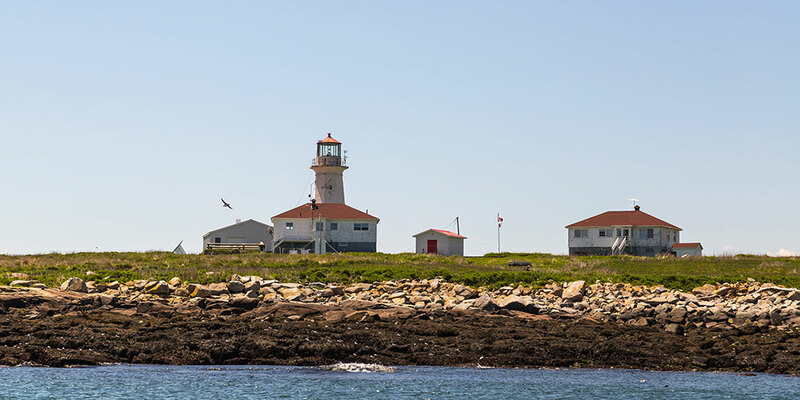 Canada maintains a lighthouse on Machias Seal Island. Some areas of the Strait of Juan de Fuca are disputed between the countries. The U.S. and Canada base equidistance claims on different basepoints, resulting in slight differences between their sovereignty claims. Parts of the Beaufort Sea are claimed by both nations as part of their exclusive economic zone (EEZ). The dispute exists in part because of different translations of the 1825 Anglo-Russian Convention, which was written in French. Precise maritime boundaries around the Dixon Entrance between Alaska and British Columbia are in dispute. An “A-B Line” established in the 1903 Alaska Boundary Treaty is considered to be an international maritime boundary by Canada, but not the United States. The U.S., meanwhile, claims that maritime equidistance is the correct arbiter of sovereignty in the area. The International Boundary is an undefended border – while it is illegal to cross the border outside of specified areas of control, there are large areas without fences or other controls. You can find information on crossing the U.S.-Canada border here. Numerous communities, a country club, a library and even several “line houses” are divided by the U.S.-Canada border. Precise mapping of the U.S.-Canada Border is available in Sovereign Limits, the world’s definitive database of international boundaries. You can explore the land and maritime limits between the nations, including zones of disputed sovereignty, in our web portal. Sovereign Limits is free to use – sign up for a free account today to explore the world’s most fascinating and important international boundaries!